NAMM 2018: The original JBL Series 3 monitors offered plenty of speaker for not too much cash, and the MkII models promise an even better listening experience and a new look. The new monitors feature JBL’s Image Control Waveguide, which is designed to ensure an acoustically seamless transition between the low- and high-frequency transducers. We’re promised tight and accurately-controlled bass and detailed highs, and controls that enable you to tailor the sound to suit the characteristics of your studio environment. 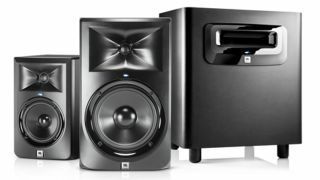 The JBL 305P ($150 each), 308P MkII ($250 each) and 306P ($199 each) will be available soon in the US. The new range is scheduled to arrive in Europe in the summer. Find out more on the JBL website.